George Dyson’s 2003 Project Orion: The True Story of the Atomic Spaceship is the biography of an atomic rocket that never was. Strike that, the atomic rocket that never was. Atomic rockets like NERVA or DUMBO may have used the power of the atom, but their approach was not so very different from conventional chemical rockets and their performance not so much better. Orion promised delta vees more than an order of magnitude better than NERVA at its best. All it asked in return for its astounding performance was a studied tolerance for proximity to nuclear explosions. Repeated explosions. The idea is simple enough: detonate a series of small nuclear devices and through various cunning means couple the energy produced to a nearby rocket such that the rocket is accelerated and not simply vapourized or blown to pieces. Only small amounts of material on the pusher plate between the bomb and the payload would sublime, propelling the craft in the process. There was good reason to think the basic idea was workable; essential physics did not forbid and only the engineering had to be worked out. Unlike many competing systems, Orion scales down poorly: bigger is definitely better. This means that while chemical rocket teams were cramming men into volumes comparable to a Morris Minor, Orion designers were considering something more along the lines of the Queen Mary. Or, in the case of one Freeman Dyson concept, the city of Chicago. Dyson, whose father Freeman was intimately involved in Orion, provides a short but detailed history of Orion, from its post-war origins to its death at the hands of the nuclear test ban treaty. Also included is list of Orion documents that interested readers can track down for themselves—a process that will no doubt bring the reader to the attention of any number of government organizations. While the Cold War context that made the project thinkable required sops to military goals— Orion’s enormous payload could make it practical to lob continent busters at the Enemy 1—Dyson makes it clear the people behind Orion were not Powers-style Atomic Warriors bent on reducing the biosphere of Earth to single-celled organisms. Not all of them, anyway. Many of them were dreamers who hoped not just to send a 4000 ton spacecraft to Saturn by 1970, but be on board that spacecraft themselves. In contrast to earlier popular histories of the Orion, Dyson is a bit more forthcoming about Orion’s unresolved opportunities. Although the physics seemed workable, that does not mean the engineering challenges would have been solvable at a reasonable price with the technology available in the 1950s and 1960s. Although it both drew on and informed real-world experiments, Orion was for the most part confined to paper studies. It is all too easy for fans of never-realized systems to focus only on glorious potentials while ignoring the challenges: Dyson avoids that. 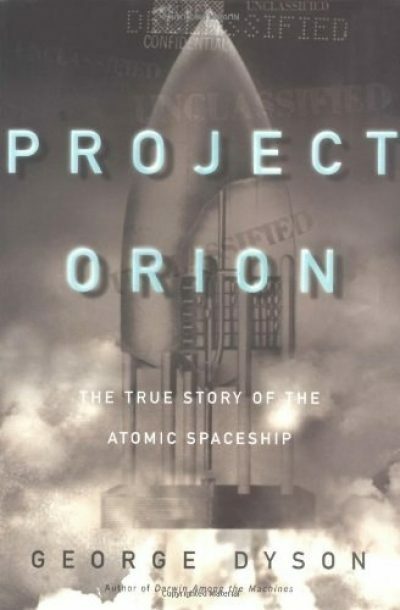 Project Orion: The True Story of the Atomic Spaceship is available here.